Bem-vindo à sua casa própria piscina de inspiração marroquina. Esta muito privada 3000 Sq. Ft. casa possui piscina privada e jardins encantadores. Além disso, o Jacuzzi, piscina e deck da piscina desfrutar do sol quase todo o dia. 6 salas de perseguição, bem como lugares no exterior é fornecido no deck da piscina. Cada um dos 3 quartos têm casa de banho privada e cada um está localizado em sua própria área da casa. Isso cria uma grande separação de espaço. Em 2016 os banhos foram remodeladas em mármore de Carrara. Além dos 3 quartos e 3 banhos de banho há um den com um banho 4, que pode funcionar como um quarto quarto semi-privado para um adicional de 2 pessoas, se menores de 12 anos de idade. A sala de família, bem como a maioria dos quartos têm novas TVs de tela plana. Como você pode ver nas fotos, esta propriedade oferece tudo o que é necessário para um retiro de amigos ou familiares. We spent 10 days recently at Deep Well Ranch. The house is very large. The kitchen is well stocked with every gadget you would need. Each bedroom is very comfortable with the master bed and bath being huge! The patio was large with lots of seating. The weather was a bit cool when we visited and so the pool, even though we paid to have it heated, was lightly used, but the spa was used daily. The location was great for walking/biking the neighborhood and was near shopping and coffee shops. We highly recommend this house for a family vacation! Great house, great neighborhood, great owner! Sorry, I thought I’d done this! I’d give this place 10 stars if I could! The house is lovely...well cared for and equipped with everything you need for a carefree vacation. The owner is thoughtful, the property manager is very helpful. We couldn’t have had a nicer visit. A true gem! 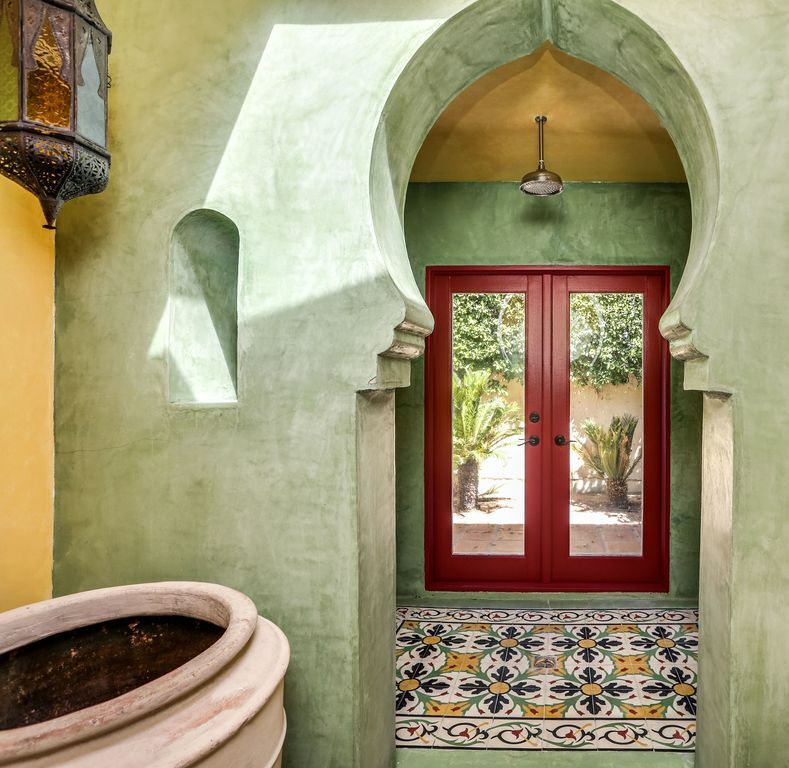 Fabulous Moroccan villa, quiet and gorgeous! We stayed at this villa for an extended weekend. The house is extremely comfortable with great amenities, fabulous master bathroom! Layout is perfect for each couple’s privacy. Another wonderful stay! You cannot go wrong with this great place! We once again had a great stay at this awesome property. We looked forward again to our return to the seclusion and quiet of this well appointed home and we were not disappointed. After a trip to Costco we were settled for another week of much needed rest and relaxation and the home and pool did not let us down once again. The neighborhood is nice and quiet for morning walks with a nice store just down the block that offers anything you might need and located 5 minutes from the airport but you will never hear an airplane. Bob the property manager is great to work with, very accommodating of your schedule and very helpful to explain the property. Thank you for another great week in PS! The house was just as it should be: thoughtfully equipped with the easy charm you want at the end of a hot summer. Amazing Property with a private pool! We have visited this property several times and already have it reserved again. It is fully appointed with the owners having thought of many of the little details. The property is extremely private with a wonderful private back yard and pool. The house is very spacious and welcoming and offers plenty of private space so as to not confine your party. Esta é a casa perfeita para desfrutar de tudo o que Palm Springs é conhecida. Pode-se nadar, sol, entreter, ou simplesmente relaxar com um bom livro e desfrutar de estar com a família e amigos. Localizado em uma rua tranquila no centro histórico da Deepwell Bairro, a casa fica a poucos minutos de restaurantes, lojas e entretenimento. Há 30 anos esta casa foi a casa de Marjorie Main, uma atriz coadjuvante indicado ao Oscar. Ela estava em tais grandes filmes como: "As Mulheres", "Encontre-me em St. Louis ', e' The Egg and I '. Ela também tocou Ma na série 'Ma e Pa Kettle'. $500 due at booking is non refundable. A credit card is required on the agreement if you wish to have he pool heated during your stay. n. Rent, tax and cleaning fee is due 90 days prior to arrival date and becomes non refundable. City of Palm Springs required that we make a copy of the renters drivers license at check-in. Our insurance company requires that A Waver of Liability needs to be read and needs to be signed at check-in.